I shut down my computer and sighed because I knew I hadn’t accomplished everything I wanted to do that day—and worst of all I felt as if there was something I was forgetting. Ever had that feeling? I used to have that feeling all too often, all because of my love/hate relationship with email. I loooove emailing friends and clients and haaaate not having a clean inbox at the end of every day. Not being able to achieve inbox zero used to make me think I was always letting things slip through the cracks. As my online business has grown, I thought I had to resign myself to never being able to achieve inbox zero because I needed to keep emails ever in front of me to remind myself of tasks to do/posts assigned me to edit from blogger clients/other emails to respond to. Then I heard of the two-minute rule. Since learning about and implementing the two-minute rule when I’m checking my email, I’ve consistently seen an empty inbox every single day (well, weekday, because I ignore my digital life on the weekends and live analog). Can you relate to that love/hate relationship I once had with email? If you’re ready to take back control of your inbox again, I’d encourage you to adopt the two-minute rule. 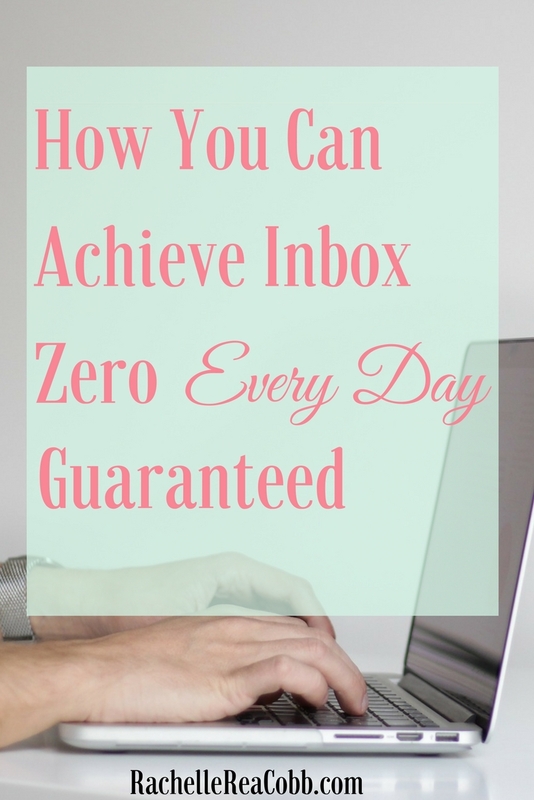 I go into detail on how you can achieve inbox zero every—guaranteed—in just a few steps below. What is the two-minute rule? If you can respond to that email in less than two minutes, respond. If you need to address that email sometime this week (for instance, you need to complete a task or write a longer response), you throw that email into your THIS WEEK folder. If you need to keep the email for future reference but do not need to do anything with it this week, throw that email into your FOLLOW UP folder. If you’re confused yet, it’s because you don’t have a THIS WEEK folder and FOLLOW UP folder yet, yes? I highly recommend you create them. I use Gmail labels, and most email services provide you with some way to “file” or “label” emails. So, open your inbox right now and create two “files,” “folders”, “labels” or whatever they’re called in your email service. Name one THIS WEEK and name the other FOLLOW UP. Isn’t throwing emails into THIS WEEK and FOLLOW UP folders going to create more work for you later when you have to zero out those folders? When you follow the two-minute rule and process each and every email that lands in your inbox, you are consciously assigning that email a task. You are either responding to that email right away, responding to that email within the next 7 days, or keeping that email for reference to either follow up or read through more thoroughly at some later date. By processing each and every email, you are sorting your inbox. Now you never need to worry about not responding to/not reading/never even seeing a critical email. I’d heard too many stories of fellow freelancers losing clients or gigs because they’d never seen an email or had forgotten to respond. So when my inbox started to feel clogged, I knew I didn’t want to some day have the same story. Now that I have made the two-minute rule a daily practice, I feel in control of my inbox. Rather than the other way around! And I never shut down my computer at the end of the day feeling like I accomplished nothing, because I’ve at least zeroed out my inbox and conquered a few of the emails in my THIS WEEK folder. So I encourage you to give it a try for at least one week. Archive your inbox. No, seriously. If you have 2,245 emails you’re never going to get to, Archive them all. If someone really needed you, they will email you again (and hopefully you will get back to them the second time!). Declare email bankruptcy to wipe the slate clean. Create the THIS WEEK and FOLLOW UP folder and process every email into those folders using the two-minute rule. If you can’t respond within two minutes, file that email in THIS WEEK or FOLLOW UP. Throughout your week, process every email in your THIS WEEK folder one-by-one. I check my THIS WEEK folder once a day, usually in the morning so I can transfer tasks to my day’s to-do list. I find that it is a whole lot easier to answer emails now that I know I need to address them this week. Once a week, process the emails in your FOLLOW UP folder. This usually looks like sending check-in emails or adding tasks to my monthly goals list. Archive (or delete) without guilt. Do not use your inbox as a file folder. Either respond, toss the email in THIS WEEK or FOLLOW UP, and then archive (or even delete!) what’s leftover. Unsubscribe. If you’re not reading Home Depot’s emails, why are you even subscribed to their list? Save yourself the time of constantly deleting their emails and unsubscribe instead. If you’re using Gmail, turn off the Spam and Promotions filters. Seriously. This has saved my sanity because no more emails get lost in these filters! Bonus Tip #2: Organizing my daily planner the same way I organize my inbox has given me a much better handle on my day. Let me know how it goes and if you’re able to achieve Inbox Zero in a comment below! I couldn’t stand the Gmail tabs either and had to get rid of them ASAP! Do you have a routine where you check the THIS WEEK and FOLLOW UP folders every day? Yes, I check my This Week folder at least once a day and my Follow Up folder once a week. That way, I don’t feel overwhelmed–which is so nice! Thank you so much Rachelle! This blog post saved my inbox! Organising my emails into folders has been amazing, and throwing some away has felt like a burden off my shoulders. These tips are great! I especially should archive my inbox–I probably have hundreds of old emails that I’m most likely never going to read again.